Children’s House is a bilingual for children / as from 2 ½ years to 6 years old family environment; It has prepared an environment titled AMI Montessori guides (Association Montessori International); in teaching English and Castilian 50% partner. They are equipped with all montessori materials for his age, and being all tailored to the child, arranged in a concrete and precise order, being designed to attract the interest of the child. Children / as of 0-6 years at a stage of formation that is characterized by a high absorption capacity subconsciously, what Maria Montessori called “absorbent mind”. This is the basis of creation of the individual. At this stage children spend their sensitive periods through sensory learning. The language, the order, the refinement of the senses and refinement of movement among others. An environment adequately prepared to answer the need is paramount, because, at this age, the basis for further development are established. Regarding the role of the adult, the child is guided out of respect as an individual and respond to their potential through a prepared environment. The link between children / as and adult allows it to accompany children in this environment from security. Bilingualism is present in the classroom through communication with the adult who lives in the classroom with the child. The prepared environment is a product designed especially for children of this age environment; prepared to nurture the development needs of children over the years. 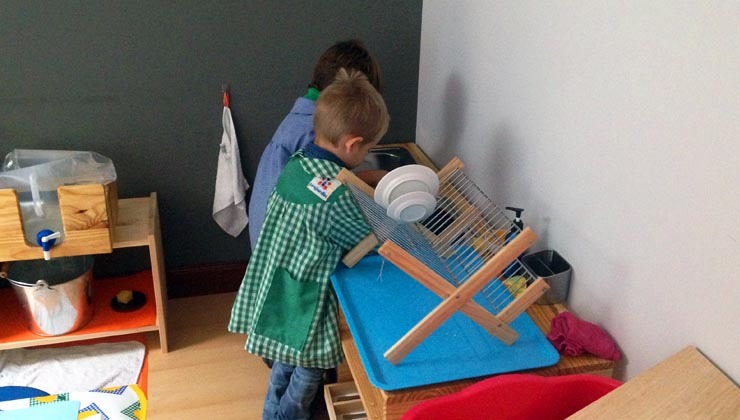 The class is divided into five areas: practical life, sensorial, language, mathematics. Sensory extensions (geography, history, science and arts). Practical life exercises are the first arrival at the house of children. They are attractive and act as a bridge with his family reality as they have to do with everyday life. This area helps the child / daughter develop fine motor skills and coordination as well as help develop the ability to concentrate. Independence, security, self-esteem, self-discipline and group cohesion is promoted. Sensory: Through this area the physical qualities of the world eexploran and helps you sort and rank their perceptions. Color, weight, length, texture, flavor, color, sound, dimension. As they increasingly refine their sensory perception, also they continue to develop their ability to concentrate, appreciation of detail and movement control. Children build the sense bases indirectly preparing them to study math and science. Language: Language is very important in children’s home. The guides have moments of conversation and try to use precise language to enrich the vocabulary of children. Games phonetic sounds to make it simple for kids. After the children trace the letters of sandpaper preparing sensory words then write an event that occurs spontaneously when the child is ready. A reading will come later following the natural rhythms of each. English and Spanish are present at all times. Mathematics: Before children can work with materials math mathematical concepts already seen from practice and sensory life such as length, weight and quantity. The decimal system internalize from a sensory point of view and is progressing on its way to abstraction starting tracing sandpaper numbers through extensive manipulation associated with each number and ending value by performing arithmetic operations. Sensory extensions: Within these materials are globes, wooden puzzles maps of different continents and countries. Specifically with this item after exploring the names of continents and countries learn. Also the products, the animals, the weather of each continent and the people who inhabit them. Increasing their understanding of cultural diversity. Others to note are scientific experiments as magnetism and flotation. etc ..
Music: Music is another important aspect that is part of the curriculum every day through song, music and movement, children are introduced to the basics of musical expression. You can also explore the tone and rhythm with bells and other percussion instruments. • The house Montessori Almería. Day morning. Monday to Friday 9 to 13:00 includes organic lunch. • The house Montessori Almería. Full time. Monday through Friday 9-15 h includes lunch and organic food. • Morning Time 8-9 h.
• 15 to 16h evening time.